Today's star is pioneering African-American actor Rex Ingram. Here he is at right with Eddie "Rochester" Anderson and Lena Horne. TCM is celebrating the career of Rex Ingram with 13 movies on Aug. 11. Here's what you need to know about a talented actor who was a star on both stage and screen. FYI: TCM sometimes changes the air times and /or movies, so you can go to www.tcm.com to check the updated schedule. Born: Oct. 20, 1895 in Cairo, Ill.
Died: Sept. 19, 1969, in Los Angeles. He is buried in Forest Lawn Memorial Park. Brief bio: Ingram was born on a houseboat on the banks of the Mississippi River, and he grew up working on the Robert E. Lee steamboat alongside his father. There are a lot conflicting stories about Ingram's early life, but his The New York Times obituary states that he earned a medical degree from Northwestern University and then decided to head out and see the world. According to the Times, Ingram was standing on a Hollywood street corner one day when an eager casting director for Tarzan of the Apes (1918) saw him and cast him in a small part in that movie. Ingram continued working steadily in silent films for the next decade, mostly playing stereotypical parts like butlers and African natives before he traveled to Broadway and hit it big in Eugene O'Neill's play, The Emperor Jones. Ingram returned to the movies in 1936. He earned great acclaim for playing De Lawd in The Green Pastures and he followed that up with successes in The Adventures of Hucklebery Finn (1939), The Thief of Bagdad (1940) and Cabin in the Sky (1943). Ingram ran into financial and legal difficulties in the 1950's, but he continued to act, mostly on television. 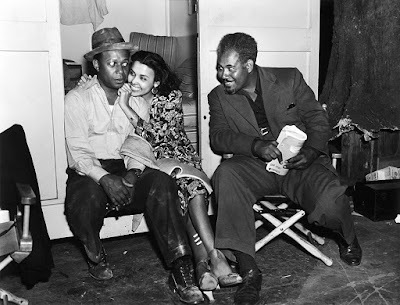 He became the first regular African-American character on a soap opera when he appeared on The Brighter Day. 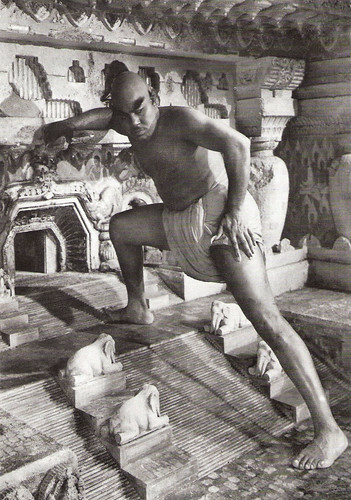 Rex Ingram as the Genie in The Thief of Bagdad (1940). Fun fact: Ingram was an avid pipe collector, owning more than 500 specimens. Signature role: The wise, soft-spoken De Lawd in The Green Pastures. 1. All black casts were a trend on Broadway in the 1930's, but that rarely transferred to Hollywood. The Green Pastures, airing at 8 p.m., is an exception. The film reenacts Bible stories from the perspective of a Sunday School class. Ingram shines in three roles, but he is best remembered for the gravitas and subtle humor he brought to his portrayal of De Lawd. 2. Ingram switched to the dark side for Cabin in the Sky, airing at 10 p.m., where he plays the wily Lucius/Lucifer, who is trying to lure a chronic gambler (Eddie "Rochester" Anderson) into hell. 3. Ingram's best known role is the Djinn or genie in the bottle in the glorious Technicolor masterpiece, The Thief of Bagdad, airing at 4 p.m.
A great film not featured on Summer Under the Stars: Ingram has a small cameo in Elmer Gantry (1960), starring Burt Lancaster as a corrupt, fast-talking evangelist. 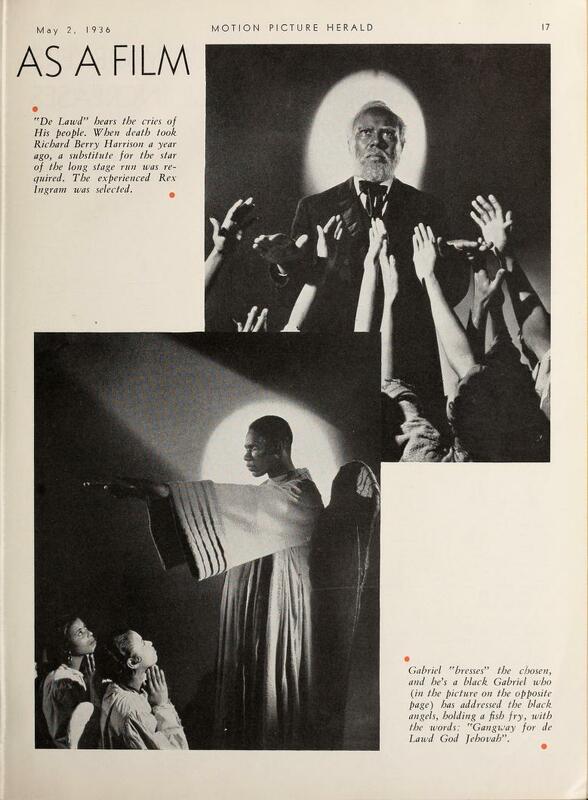 Fan Magazine Flashback: Ingram as De Lawd and Oscar Polk as the Angel Gabriel appear in an article about The Green Pastures in the Motion Picture Herald. Courtesy of the Media History Digital Library. Old Hollywood video: A trailer for The Green Pastures. For more Summer Under the Stars articles, go here. There'll be plenty more on Ingram on social media. Follow me on Tumblr, Google+ or Pinterest or like us on Facebook. Follow us on Twitter @oldhollywood21.